The Sub –Jjunior Volleyball team of St. Mark’s Sr. Sec. Public School, Meera Bagh secured Runners Up position in the Zonal Volleyball tournament held in the school premises. In this tournament 32 teams participated. Our team players are Aman Solanki (VII B), Kshitiz Solanki (VII D), Kawaljeet Singh (VIII E), Tanish (VII D), Arnav (VIII E), Mansubag (VII G), Amough (VII C), Raunak (VII B), Kartik Solanki (VII F), Akhil (VIII E), Bharat (VII C) and Varun (VIII B). A Mini National Volleyball Tournament was conducted by the Volleyball Federation of India, from 29 November to 5 December, 2010. The tournament was organized by St. Joseph Engineering College, Chennai. Twenty teams of girls and twenty one teams of boys from different states, participated in the tournament. Mr. Rajan Manchanda of St. Mark’s Sr. Sec. Public School, Meera Bagh attended the tournament as a coach of the Delhi Team. Diksha Solanki of our school was also a member of the Delhi team. The Delhi team defeated but lost against the host team, i.e., of Tamil Nadu and Andhra Pradesh. It was a good platform for Diksha and by playing in this tournament she brought laurels to the school. It was a great learning experience for them. St. Mark’s Sr. Sec. Public School, Meera Bagh participated in CBSE Volleyball Tournament organised by Ved Vyasa D.A.V, Vikas Puri from 20 to 22 October 2010. Our senior girls beat Tagore International School (Vasant Kunj) by 25 – 9 , 25 – 4 respectively. Then in the second match they beat Holy Child School by 25 – 12 , 25 – 14 respectively. Our school team played very well and it was a good learning experience for them. The team comprised of Sanya Chugh (XII D), Rashi Grover (XII D), Shweta Sharma (XII D), Mehar Bakshi (XII G), Harleen Kaur (XII D), Naina Arora (XII D), Anushka (XI G) and Sanya Khera (XII B). 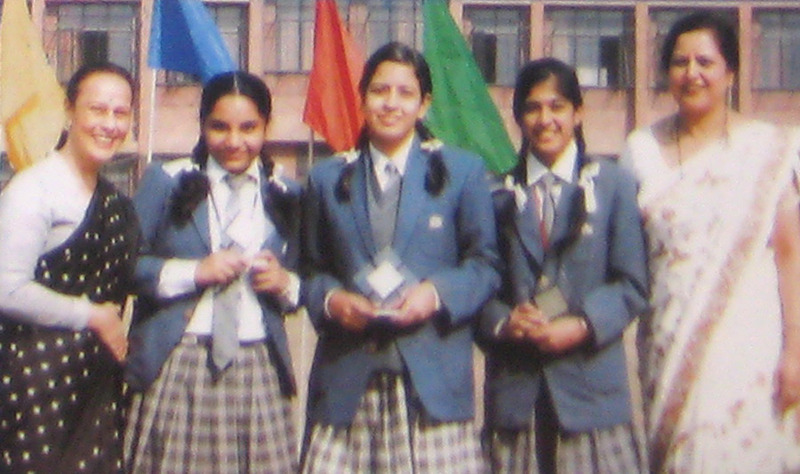 The Junior Girls Volleyball team won the Volleyball Tournament held at N.C. Jindal Public School, Punjabi Bagh. They defeated the host school and bagged the first position. Our team comprised of Sanya Chugh, Aastha Ajmani, Rashi Grover, Shweta Sharma, Harleen Kaur, Palak Khurana and Mehar Bakshi (IX).